Pattern: I faked it. Yarn: Must Stash, in the fab colourway “Happy Snowman”. Needles 2.25mm. I started the second while I was walking. and voila. Another pair fell right off me. I just started another pair, and I suddenly feel like I’ve properly signed up for Socktober without even thinking about it. Let’s see… shall we? Lately fingerless mitts seem to be falling off my needles. Good stash busters! I’m so glad you’re back from your trip and that you had a good time doing what you do so well…inspiring others. I’ve been thinking about you and hoping you’re doing okay. I’ve just done an inventory of UFO’s and came to the realization that NOTHING falls off my needles. I tell others “you can’t rush a masterpiece” but that really over states my knitting skills. Same here— nothing is falling off my needles…..
*snort* We had this conversation in the comments while Steph was away. I may or may not have embarrassed myself with a similar statement. I’ve had a pair on the Needles for almost 3 years now. Lmao!! So sad! I recently ripped out the first sock of a pair because the beautiful yarn was too dark for a stitch pattern, size 1 needles, and old eyes. If you want a contest for slowness, I already win. I so envy those knitters who can knock out a project in mere days, maybe a dishcloth. I’m a moderately quick knitter, but I can’t finish socks in 2 days. Two weeks, if I’m pushing, sure. I tell myself that in addition to being a faster knitter, Stephanie must know people with smaller feet than I do! “Inventory of the UFOs”. I need, but really don’t want, to do that too. The numbers would have to be well into the teens. And then Steph shows us super-awesome-coloured socks and I think “should become a sock knitter”. Back away slowly!!!! how how HOW can you knit so darn fast? I’d be lucky if I managed a pair over two weeks . . . . .
Look up Steph knitting on YouTube, she is incredibly fast! Big hugs and those socks look great! I’m trying project monogamy for a while, and even though I love the results, it’s hard to stick to one project. All the other projects are so seductive. LOL. I’m always so impressed by your sock knitting skills. I can never get the fit right. You’ve advocated monogamy on a blog run by a harlot. Well, she did say she was “trying monogamy” and she did say “it’s hard”. I’m thinking she may not stick to it, especially if she keeps reading a blog run by a harlot. I only ever knit one project at a time. I find it works best for me. It keeps me motivated to not abandon a project, because only once it is completed can I knit the next amazing project. I am a very fast knitter so it doesn’t take long to move on to the next project. Oo! I forgot it’s Socktober! I might have to put the shawl down and start a pair. Does buying sock yarn count? I bought some on Sunday…. just waiting for it to arrive. Lol, i have been bingbuying sock yarn… let’s not discuss the fact that I had to upgrade the size of my storage unit… for my yarn stash! 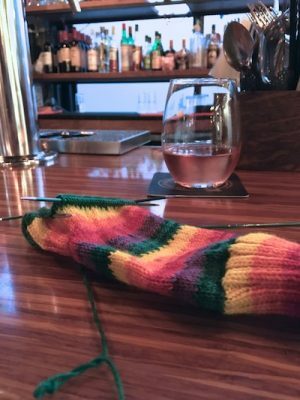 Totally agree that socks aren’t really “projects”, at least in my own knitting universe, probably because most of knitting energy goes into my sweater designs, while socks are a utilitarian thing ( I mostly wear them in bed) that most people don’t notice. warm vibrant colors there and I can’t resist knitting a stripe. I may do socktober. this might be my breakthrough (read ‘pay attention to guage’) month. Those rainbow socks are the happiest thing I’ve seen on these interwebs today. I might have to hunt that yarn down. Even if I need a baby afghan to fall off my needles. I also wonder how you can knit so fast. At least you have some items to put in your christmas basket. Its not to early to start! Ditto! How does she knit so fast? Is there a u-tube video? Would love a demo. Bet others would, too. Pretty please with sugar with on it? There is video, actually. I remember being flabbergasted.n A search of the archives might turn it up. Found one. There are others search”Yarn Harlot knitting for speed” on YouTube. Blessings on you, Cara ! Holy crap. That’s astounding. Thanks for finding that, Cara, both for the sheer entertainment value (the slo-mo voiceover part was very funny), and for the educational value (the slo-mo part was super helpful, and I’ll totally try modifying my technique). Steph: I can now understand how socks could, in reasonable fact, fall off your knitting needles. Even the slow-mo is faster than my knitting speed! I consider Socktober a success if I finish ONE sock. Which obviously does not match up with the pace I buy sock yarn at. Thank you so much, Cara! Really enjoyed that video. 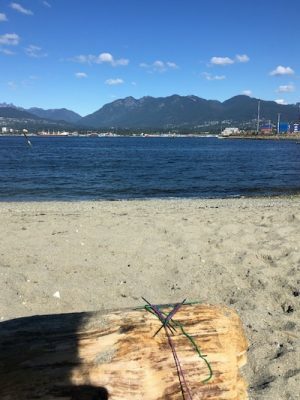 Glad to hear you had fun in Vancouver, Stephanie. I love the yarn in both pair of socks! I knit my socks usually in the car, and haven’t touched the current pair in a long while. :/ Poor sock! I always go back to my sock knitting though, and finish. Right now I’m trying to get caught up with some Christmas knitting in the car, a hat to go with a shawlette that’s finished. 🙂 But those socks have been calling me! Do it. Do it. Do it. Do it. Do it. Do it. Do it. Last night was the second class of Knitting 101. The first week we learned to cast on and knit. I worked before class to get a reasonably substantial knit stitch swatch done, because I was afraid everyone else would have a bigger swatch. Ha! Most of my classmates had barely started theirs! Last night we learned the purl stitch, and we’re supposed to show up for Class 3 with a swatch that is knit stitch one row and purl stitch the next row, for about 4 inches, so we will know if we have gauge before we start the class project, a hat. I’ve crocheted for so long it’s easy. Learning a new fiber craft is challenging, though I agree with Stephanie that anyone can learn. Even a sleep-deprived 59-year-old (as of last Monday). Are you trying 2-handed technique? That was the breakthrough for me. Colorwork is so addictive! Are you going to Rhinebeck this year? If so, please rock those Happy Snowman socks. I guarantee they will make everyone who sees you smile. They are simply striking, and to surrender yourself to Socktober is a lovely idea. I also know how important it is to take care of yourself during an endeavor such as this, so I dare say you’ve already won. You’ve warmed four feet this winter! How lucky are they? Of course you should participate in Socktober! What a silly question! As someone has already mentioned, you could get an early start on your Christmas knitting. You might actually finish Joe’s before Christmas! 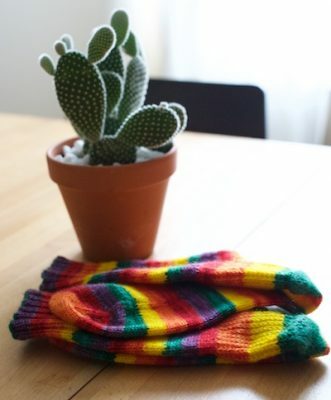 Such happy socks… love the colors! And love seeing the socks take a tour where ever you go again. Can you Kinnear again? I think I’m in love with your cactus. Looks like great holiday knitting to me. Do you know how many weeks are left until Christmas? Socktober of the long range planning box type sounds like an excellent idea. – not now, I have strenuous activities to back to! Welcome back! We really missed you. You start to knit lace socks, I’ll know you are going to be alright. Much love, sympathy and all the strength I can send you! I finished a pair in September and 1/2 done with a pair for October. My next one may take longer as I am going to try 2at a time toe up. Wish me luck. The fact that you will have a finished pair will speed you along! I always dread a second sock – especially if it is plain; however, when I do 2 at a time (toe-up always) the driving factor is the fact that when I weave in the ends I will have a finished pair ready to wear. Good luck! Now those are cheerful socks. Someone’s going to have very very happy feet. My name is Lynn, I am a knitter but I have never knitted a pair of socks, there I said it!! What is wrong with me, I bought a black coat for winter so I thought I would brighten things up with a red scarf which I just started, my daughter is going to knook me a red hat to match.But I really want to knit socks when I see yours!! Must learn! I started a pair of socks, but never got past the ankle on the first one. Maybe one day. I have some yarn, but don’t have the nerve for the heel. But the heel is the best part! Looks hard but is just plain fun. Learn the afterthought heel! Quick and as easy as a toe! Check out Kirby Wirby afterthought heel on Youtube. But turning a heel feels like magic. Just follow the directions, no matter how odd they seem, the first few times. My latest on the go knitting is baby booties. I can knit a pair of those in a couple of days. Things are falling off my needles, but not always in a good way. It seems the easier the stitch pattern, the more trouble I have. Tinking back a rib where every other stitch is K1 below is nerve-racking; it is impossible to simply drop down a few stitches to repair mistakes, at least for me. I did, however, complete a Find Your Fade in 4 weeks and a PEEP Show Shawl in 2 weeks, although neither have been washed ir blocked and the ends remain I woven in. And my two pairs of socks have been languishing for several months. I want to make a different pair instead! Love the rainbows – hope it means there is some sunshine heading your way. Please, please, please – how do you do that “jaggedy” edge on the second pair? Or what is it properly called, so I can look it up? I’m wondering that, too, Stephanie: are you slipping every second stitch in the first round where your yarn changes colour?? Brilliant! I know, there is a free pattern called “Vanilla Bean Striped Socks” – this seems to be the same. In the Antipodes, we are zooming out of sock weather and straight towards it’s even too hot for undies weather. No socks on these needles! PS see you in five weeks! Squee! Love the really bright socks . 2.25mm US size 1. Caution: If you’re buying needles in the US, look at the packages by their metric size. Some companies sell size 1 as 2.5mm. (Ask me how I know all size 1’s are not created equal.) 2.5mm is also sometimes listed as size 1-1/2. I just wish sweaters would fall off my needles as easily as socks seem to! Love the colors on both, but I’m wondering how you got that little fringe-y color change on the 2nd pair. (between the yellow and green it’s most obvious but lovely) Slipped stitches? I seem to have gotten away from socks (and knitting in general) lately. I bought some socks off of Amazon, and the whole enterprise just collapsed on me. And now, crochet seems to have taken over my crafting life again, as it does periodically. I learned that when I was very young, so it’s still somewhat of a cozy native language for me. Did you do something fancy with the color changes? Perhaps some slipped stitches? Gorgeous socks. Glad to see you socking it to the world! But I need help! I too do socks with great abandon, but what I need is a mitten month! Will you declare one for me??? lol I know it doesn’t get as cold here in Mid Coast Maine as in Toronto… but we still need mittens. I just think I’ll start a pair and whoops it has a heel and turns into a sock…. I am doing some other things…for Christmas. but I think mittens need a month too! Love the colourful stripes! They’re enough to brighten anyone’s day. 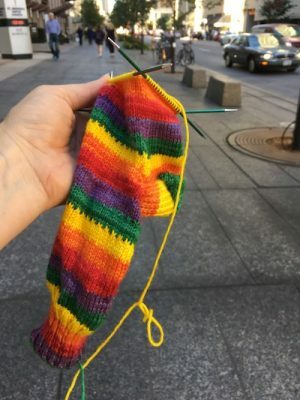 I tried knitting while walking, but since I have to pay close attention to where I put my feet and staying upright, it was a bit of a disaster. Knitting at the wheel of the car is frowned upon, too. 🙂 I think I’ll stick to my rocker. This winter, sweaters will be falling off my needles. I have only ever knit one, years ago and it didn’t fit. I was terrified to knit another one. I am currently knitting Radiate by Joji Locatelli and am loving the pattern. 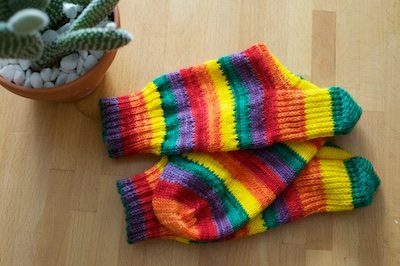 Socks are my go to comfort knits (like comfort food)… except for the last sock KAL which was nerve wracking because of such complicated patterns! For me, it’s rolled brim baby hats that are always in the works. I can barely keep up with the babies! Friends of my daughters. Co-workers of my son-in-laws. Grandbabies of my friends. They just keep coming. I’ve made so many, that I don’t need a pattern anymore. It’s nice to have something that’s so quick and so familiar to fit into the small spaces of knitting time. Know that you are loved and cherished, though not as your mother did, but you are still cared about by a whole community of knitters. I pray it gives you some measure of comfort. Oh, and the Trifolium? That’s String Theory Colorworks, not the same company as just String Theory. (Don’t know why I’m so charry today, I’ll be quiet now. Not only do things NOT fall off my needles, but they often get lost on the way. I just found a pair of socks I’ve been making since I got the yarn at Rhinebeck the year before last (Bijou Basin yak yarn!). They were in a very safe place. I need to finish the toe section of the first sock, and then try like Hades to get the second sock done so I can wear them when I go back this year. Oh how fun! I have the same “problem.” They make such great gifts for those we love. My feet are cold today for the first time in months so I am in awe of those socks. So glad you’ve turned a heel or four. October always makes me feel that I’ve turned a corner on the year, coming into the home stretch. I’ve avoided sock knitting for a time (aggravates my shoulder bursitis) but Socktober is calling to me and it sounds great. 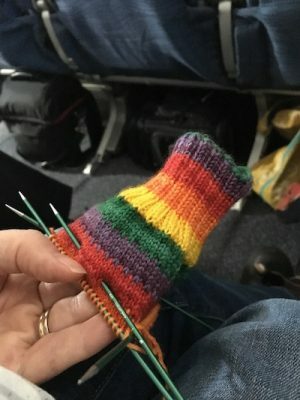 Can anyone remember the title / date of the awesome post when Steph was knitting socks for the baby and it led to that brilliant essay on gender stereotyping and violence against women? Lovely socks! I only wish. I’m becalmed in the midst of a giant baby shawl, on a serious deadline, and with over five metres of knitted lace edging still to go. I yearn for socks. I pine for socks. I am ignoring everything else but this shawl. But ah, once it is done and November approaches? Nope, still no socks; then I’m finishing up an Aran sweater. But it’s all Knitting, so I’m OK with that. I forgot about Socktober, but I am prepared…one sock done last night, second started on my lunch hour today. With another pair already planned (pattern, yarn and needles). Have you tried the circular 9″ inch needle for socks? I’m trying it on my next pair. I use a 9″ circ for everything but the heel and toe (top down). My most recent finished pair was Afterthought Everything Socks. One knits a long tube, inserting waste yarn where each heel and the toes will be. Then the heels are knitted, the pair is separated at the midline and the toes are done last. 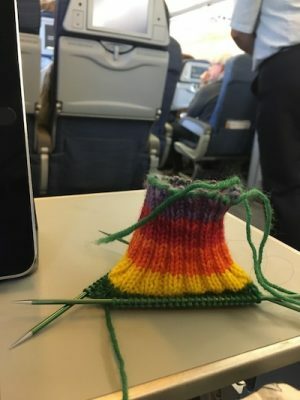 Perfect travel knitting: no loose dps to get lost in one’s seat or roll down the plane aisle; the fiddly bits (heels and toes) can be done while waiting on the next flight, or once one gets home. I knit considerably faster Continental than English (actually, I’m a “combined” knitter, which should be faster yet), but I can’t manage anywhere near Stephanie’s speed! Oh, good — I’m to touch the chair and not the cat — who’d be in my lap the instant I sat in the chair! Those are the most beautiful pairs of socks! I seem to be having “Fingerlessmittober” , to be followed by “Cowlvember”! Did you know that Bloodhound drool can pit metal needles and take the varnish off wooden ones? The only time socks fall off my needles is when Frisco puts his 100# body in my lap. Hard to be angry when getting these sloppy kisses. Really hard to knit yarn stiff with drool. 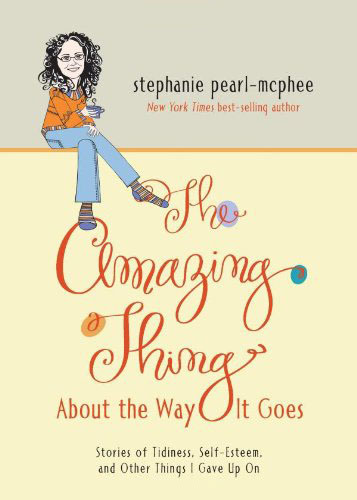 Stephanie, reading your posts gives me hope. My mom has terminal cancer and most of the time I feel like my life will never, ever have any semblance of normal. Seeing you ease back into things that were part of your life before your mom’s death gives me hope that things won’t be bleak forever. Thank you. Your life will get to be normal, just not the same. you don’t accept, exactly, but you do adjust. my mom’s been gone ten years as of 27th, and she died of cancer as well, and that’s how it’s been for me. You do adjust. As I pulled out the wool socks last night now with my floors being chilly, I was thinking it was time to get another pair on the needles. Socktober. My socks don’t just fall off my needles as quickly as yours do (maybe I should have started in July), I am thinking of Crazy Socks, combining leftover sock yarn to see what happens and keep my interest. What is “socktober?” Lovely socks by the way, I have a pair I work on only during boring conf. calls. Thankfully I work from home — it’s ok for everyone to bring those silly fidget spinners to a boring meeting, but imagine if I walked in with my knitting!!!!! I take my knitting to meetings, especially the big ones where you’re not expected to do anything but listen. People look at you oddly at first, but I figure it’s better than falling asleep during someone’s presentation! Love that colorway! I must knit mine up and then wear the socks! Socktober indeed! I am glad, very glad that you had a nice trip and you are back in time for Thanksgiving. Same here! I consider socks my “keep my hands busy while I’m figuring out what to REALLY knit” project. They also work great as a “what do you mean I have to be social?! ?” project (aka security blanket). Good to read you again. After your last post I was a bit concerned about you although I know you must have a big safety net. Sending you hugs. My mother taught me to knit (and crochet, needlepoint, sew, etc) some 50 years ago when I was a little girl. I tend not to wear socks, except when the Canadian winter demands, which might be why I have only recently discovered knitting them! I feel this is a safe place to admit that, several pairs in, it’s still new and exciting. Since it is new, I was scouting round the net the other day, looking for info on how — and how often — to block socks. Found a website I won’t name, but it was pretty informative at first, until…. Under the topic of how often, the author opined that you should wash your socks after every wearing because — wait for it — “feet are gross.” Not “your leaky mucking-out-the-stall boots are gross.” Not “your son’s 9-month-old gym shoes are gross.” Not “toenail fungus is gross.” Not even, “you stepped in doggy-doo, go wash your feet, ‘cause that’s gross.” No. Feet are gross. Categorically. What??? And I thought to myself, this is why women can’t get ahead in the world. How will we ever get past BS like “breasts are obscene,” if there are still fools ranting that feet — poor innocuous feet??? — are gross. Sometimes, I despair for humanity. Luckily, the cure for despair? Knitting socks! PS: And now I get to click the foot. Serendity rules. Thinking of you as Thanksgiving approaches. Wishing you a peaceful gathering with warm remembrances of years past. Looking to see if you are going to Rhinebeck, I feel like I am channeling you with my sweater progress…. Wait….what? 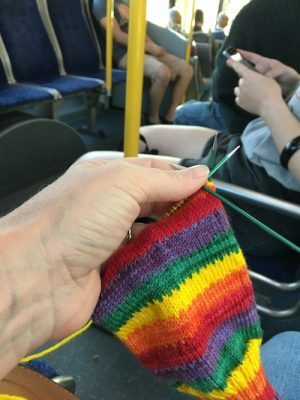 You knit socks while walking? Tell me how that works. Maybe that would inspire time on the trainer. Stephanie, the Victorians were right. It takes at least a year. You already know that the patches of being ok begin to happen, then gradually get a little longer and a little more frequent. I lost my mother in 1988. I was 32. She was 62 which is my age now. I was so not done with her. I have a million happy memories which I share with my (now grown-up) children, who did not get to know their grandmothers. And the occasional melt-down. You do so much for so many people. I am glad you have such support. My mother had two pieces of advice for difficult/unbearable periods. The first was “one foot in front of the other foot”. In dire circumstances, it was “breath in, breath out”. You like those *darned* fancy socks? I see what you did there! Lovely! I’m so glad you’re moving gently back into the world, knitting and otherwise. So glad you’re back from your trip ! Steph, the color combination and stripes looks fabulous, i can imagine how fast you are. To me it will take 2 weeks to complete but you are amazing. Hands down for this pattern. Looking forward to have more posts like this. I’m glad you’re back from your trip! and I love looking at your project pictures! To me socks are more of “time fillers” for when I’m waiting or in the car (when DH is driving, of course!). I keep a pair of my “basic sock” on the needles in both cars and switch them out as they are finished. My “fussier” projects are the ones I keep by the couch. P.S. 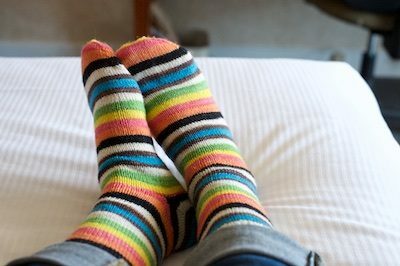 I love self striping sock yarn…they make me look so clever to the non-knitters out there! Hiya Stephanie. Thank you for your sock pattern. It’s the only sock pattern I’ve ever used and I think now after four pairs of socks only two of which have made it that I get it. While I knit socks these days I listen to Louise Penny’s Inspector Gamache mystery books. Have you read these I wonder? I’m American and since the election here, I have fallen in love with all things Canadian. I wish I could live in Canada. Anyways, I wanted to say that when I read Louise Penny’s descriptions of Three Pines I think of you and your life. Pretty idealistic I know – but I wanted to tell you anyways. It’s a cozy mystery series; comfort reading. I hope if you haven’t read it you will get some and be hugged by the people of Three Pines. They are your people.